that fateful day unfold in the safety of a hotel lounge far away from home. 3 pm in Athens, Greece and I just started giving a lecture at a marine science symposium at the University of Piraeus. One of the organizers came to the lecture room and whispered to me as I was giving my talk that a plane hit one of the Twin Towers. And I continued on, thinking that it was just an accident. Certainly those massive Towers can withstand any plane. A similar accident also occurred before long ago with a plane hitting the Empire State Building and nothing catastrophic happened. A few minutes later, he came back to tell me that a second plane hit the other Tower. By then almost everyone in the conference room were rushing out by the coffee area, watching the events on CNN. I rushed back to the hotel and became glued to the TV, just like the rest of the billions of human beings on that day. Singapore and from there finally to NYC. Hardly an adventure worth recounting when someone asked where I was on 9/11. for the first time. In 2000, I looked at several floors at the Twin Towers for Poseidon Sciences as home office. Only the high expense of the lease and the longer subway ride talked me out of it. 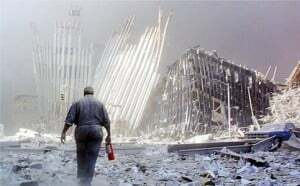 The Twin Towers was never pretty, but it exudes power and presence. Not having enough money and being lazy to take a longer subway ride saved me from that disaster just a year later. so far away then. In fact, I had not gone to see the makeshift memorial after the attacks or even came close to the ruins to this date. of General Hospital Psychiatry showed that New Yorker’s use of mental health services only rose slightly after the September 11th terrorist attacks. In fact mental health providers were prepared to provide mental heath services to the thousands of New Yorkers anticipated needing those services, but the expected need never really materialized. Must had been the NY attitude thats hard to fathom at times! What I think happened instead was the overwhelming need to do something. Some as big as joining the armed forces to fight overseas or as little as helping those in need, big or small. The disaster galvanized people to do something then as therapeutic journey to solidarity. And, on this 10th anniversary, those who had done little, like yours truly, have some soul searching to do. I am not sure if many feel the same way. As a scientist working on marine science issues seemed out of place here, my work irrelevant in many ways. Jenny enjoying Nat Sherman cigars I sent for her 'boys.' Just one of the few pleasures in the desert of Iraq. This asymmetric warfare, a war between a high tech nation and a low tech enemy, has a common thread repeated thousands of times in thousands of wars over the millennia– that young men (and now women too) go to war and young people die. The basic common thread is always the human element. Iraq running convoys through IED infested highways in and out of Baghdad. As an army captain, she is now again getting fresh troops ready for her third tour, this time in Afghanistan. My son, Jason, joined the US Air Force and served his tour in Jalalabad, Afghanistan with a Predator surveillance squadron. We, as a nation, fight wars through our children. This is nothing new in the history of mankind, but something new and personal to me. Today, as the 10thanniversary of that fateful day unfolds, perhaps it is time for me to finally come to terms with my own “post-traumatic shock,” see the Memorial and think about what I can do next for my adopted country.